Owners of 'advanced energy' coal power plants will be stuck with inefficient white elephants. The coal industry has stepped up an advertising campaign against what it has branded a "War on Coal". The goal is to encourage the construction of coal-fired power plants. Each new coal-fired power plant will lock-in buyers for thermal coal for the next 30 to 40 years. What is good for coal mining companies is not so good for the energy industry and its customers: the businesses and families who pay energy bills. This coal industry advertising campaign talks-up new coal-fired power plants by calling them "advanced energy". In reality these "advanced energy" coal-fired power plants suffer from very limited efficiency. Less than half of the energy in coal is converted to usable electricity. By 17 March 2014 the coal lobby removed the web pages for its promotional web site "Coal Can Do That" but a copy of this article by Frank Clemente was cached by Google as it existed on 23 February 2014. By 2 April 2014 the coal lobby removed the cached copy of the web pages for "Coal Can Do That". You may still read a copy of the "Coal Can Do That" article "Coal-to-Gas is Off-the-Shelf Energy Solution" from February 2009 by Dr. Frank Clemente. 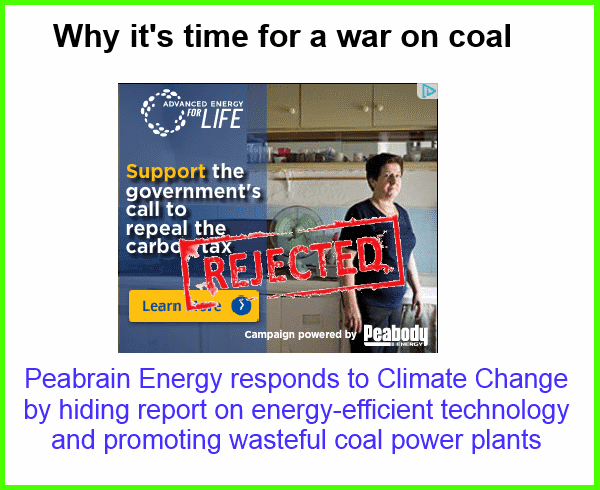 This "War on Coal" campaign now talks-down this far better power generating technology that is more efficient. At least 60 percent of the energy in fuel is converted to usable electricity. When used for "Combined Heat and Power" systems over 90 percent of the energy in fuel is delivered to customers. A fuel processing module that converts any carbon-containing raw material (coal, natural gas, crop waste, etc) into hydrogen and carbon dioxide. The fuel processing plant can grow its market by selling hydrogen and carbon dioxide to fertiliser manufacturers and other chemical industries. 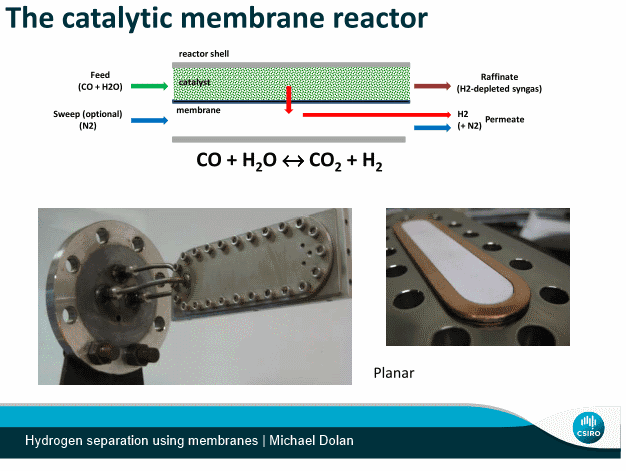 the CSIRO is actively developing hydrogen separation membranes for continually cutting the cost of producing hydrogen and carbon dioxide. the CSIRO has commercialised SolarGas - employing concentrated solar thermal energy to decompose carbon-containing fuel sources into hydrogen and carbon monoxide. Owners of "advanced energy" (sic) coal power plants will be stuck with inefficient white elephants for 30 to 40 years watching their competitiveness decline steadily against the superior, flexible energy producers. Coal is no longer the cheapest form of energy in America. Innovation by natural gas turbine manufacturers continues to increase efficiency of natural gas power plants. Coal-fired power plants are no longer competitive. "We’re shutting a 550-megawatt coal plant and replacing it with a 2,500-megawatt natural gas plant." HE restored an oath of allegiance to the Queen when he was sworn in as Prime Minister, but Tony Abbott has ruled out bringing back Knights and Dames in Australia. Monarchists including David Flint and Alexander Downer have mused that the PM is such a traditionalist that he may follow New Zealand's lead and bring back knighthoods. But critics within the Liberal Party have savaged the idea of as an attempt to introduce a "bunyip aristocracy''. In an interview with The Sunday Telegraph, Mr Abbott said he did not support the idea, which would involve converting the Companion of the Order of Australia (AC) to Knighthoods or reintroducing a new regal honour. "It's true that some people have said to me: 'What about doing what New Zealand did','' Mr Abbott said. "But I don't think it would be practical to just rebadge ACs. There was a rarity to their AC equivalent which made it easier for them to do this." Asked if Sydney radio broadcaster and friend Alan Jones had pushed the idea, Mr Abbott said he had not. "No, no, no. Just a bit of chatter. I don't think New Zealand is a relevant model here. "The problem is they just basically converted there ACs into knighthoods. I just don't think that's realistic in this country. "Look, I am pleased that we've got Sir David Smith and Sir Rod Eddington. Good to see Sir Bradley Wiggins as a result of things he did in the United Kingdom. "I don't mind having Knights and Dames around. We've thankfully still got a few." Former Prime Minister John Howard's appointment to Her Majesty's Order of merit (OM) also sparked discussion about the option last year. It was Gough Whitlam who axed Knighthoods in 1975, only to watch Malcolm Fraser reinstate Knights and Dames a year later. Then after the 1983 election, then Prime Minister Bob Hawke abolished the category all over again. John Howard is understood to have rejected the idea of reinstating Knights and Dames on the grounds that the endless chopping and changing was undermining the dignity of the honour. Many of his advisers also believed the Liberal Party would be mocked and seen as out of touch with modern Australia. Australia is being left behind in the energy productivity race. Photo courtesy of The Conversation When Australia hosts the G20 Leaders' Summit in November, a top agenda item for its “Brisbane Action Plan” will be “practical actions to improve productivity and competitiveness” . Here's a good place to start: tapping the billions of dollars of savings available to Australian businesses and consumers, with a goal to double our energy productivity. Register three people from the same organisation at full price and only pay for two. Both State and Commonwealth governments see boosting productivity and competitiveness as core to their reform agendas. For the first time, energy is being seen as an integral element in that agenda as Governments try to address specific competitiveness issues caused by recent electricity price escalation and the current major gas price increases to limit loss of manufacturing jobs. The 2XEP Forum brings together leaders in each sector of the economy to discuss how we can double our energy productivity to directly address all these challenges, as well as oil supply security and meeting our carbon reduction targets. The 2XEP Forum provides a unique opportunity for policy makers, advisors and industry, environment, transport and energy departmental officers to hear and interact with many key leaders in a concentrated two days. Gain a better understanding of the issues and expand your network at the Forum on Energy Productivity. Governments around the world are implementing policy to cut carbon emissions and energy costs at the same time. Europe and China have aggressive plans to do more with less energy. Meanwhile, President Obama has committed to double U.S. energy productivity by 2030 (view video). It is estimated that doubling energy productivity in the U.S. could deliver $327 billion in savings and 1.2 million jobs (view video): the benefits would be no less significant to the Australian economy. Then register for the Forum immediately. Do not miss your chance to engage with these leaders. "more electricity to be generated from fossil fuels"
"Electricity emissions growth is expected to accelerate from 2020 to 2030, with emissions projected to be 243 Mt CO 2 -e in 2030 or 23 per cent above 2012 levels. Higher emissions growth is due to increased demand for electricity that is largely met by fossil fuel generation." Recent modelling conducted by the Treasury and the former Department of Industry, Innovation, Climate Change, Science, Research and Tertiary Education (now the Department of the Environment) indicates the amount of emissions reductions required to achieve Australia’s 2020 target of 5 per cent below 2000 levels is less than previous estimates.1 This fact sheet explains how Australia’s abatement task has changed since Australia’s Emissions Projections 2012. Australia’s abatement task from 2013 to 2020 has fallen from 755 million tonnes carbon dioxide equivalent (Mt CO2-e) in Australia’s Emissions Projections 2012, to 591 Mt CO2-e in modelling undertaken for the Climate Change Authority’s (CCA’s) Targets and Progress Review Draft Report. 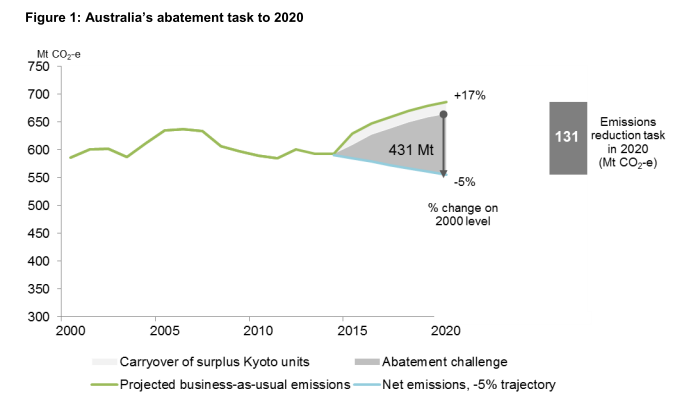 For further information, refer to Australia’s Abatement Task and 2013 Emissions Projections. This reduction is mainly attributable to a revised outlook for activity in emissions-intensive sectors of the economy. "Australia's abatement task reduced by the carbon tax in 2012-13 AND 2013-14." When other factors such as abatement from two years of the carbon tax and the ability to use surplus reductions achieved in the first commitment period of the Kyoto Protocol are taken into account, Australia’s abatement task falls from 591 to 431 Mt CO2-e.
1 Year references are to financial years ending with the year specified. For example, 2013 refers to 2012-13. "Australia's abatement task reduced by lower cost estimates for wind and solar." abatement from the carbon tax and Carbon Farming Initiative in 2012-13 and 2013-14. The Online Open Day is on this Saturday, 15th March from 12:30pm. Register your interest and find out how online study works at AIE. AIE graduate, Josh Boggs is in the spotlight with his soon to be released game, Framed. Are you a graduate who is doing great things and want to be part of an exclusive Alumni event? Leave your details here and we will get back to you with more info. AIE students play a key role in the Enlighten Festival in Canberra, creating some amazing graphics that were projected onto iconic buildings. Students have been fortunate enough to have industry speakers from Disney, Pixar and Nnooo come in to share their industry knowledge. Now - Applications for Online courses open. Copyright © 2014 Academy of Interactive Entertainment, All rights reserved. Algal blooms are a natural occurrence, however, due to human activities (such as land clearing, destruction of riparian vegetation, water extraction, decreased flow and flow variability associated with weirs and dams, discharge of sewage and intensive agriculture), higher quantities of nitrogen and phosphorus have been reaching inland waters. Periods of low or no flow in many rivers have also increased due to high water extraction and river regulation. The combination of high nutrient levels and long periods of low or no flow provide ideal conditions for algal blooms to develop. For human uses, blue-green algal blooms in drinking water resources is the most serious issue. Traditional water treatment methods are unable to remove the algal toxins from algae-contaminated water, while other alternative water treatment methods are expensive. Blue-green algal blooms may affect the recreational use of a waterway by decreasing its aesthetic amenity and posing a health risk to individuals who have direct contact with the algae. "A $40 a tonne increase in the US in December has led Australian farmers paying up to $200 a tonne more for the fertiliser diammonium phosphate (DAP)." 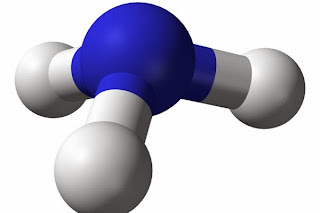 Point sources of nitrogen and phosphorus include sewage treatment plants, intensive agriculture (such as cattle feedlots and piggeries) and industry. Although in most river systems, point sources only contribute to 5% to 35% of the total amount of nutrients entering the waterway (Environment Australia 1996; NPI 2000), their impact can be proportionally greater. Point-source discharges are usually continuous and often contain high levels of nitrate and phosphate, forms of nitrogen and phosphorus that can be readily used by algae. In dry weather, diffuse source nutrient pollution is generally low and point sources are the largest source of nutrients. The greater stability of the water column in dry weather is generally more favourable to the development of algal blooms (SKM 2001) and there is also less flow in river systems to dilute point-source discharges. Although there is information on the quantity of nutrients discharged from sewage treatment plants (NPI 2000), there is no comprehensive information on other point sources. ... The contribution to nutrient loads from intensive livestock enterprises is potentially considerable as these facilities are widespread, often poorly regulated and generate wastes that are high in nutrients (e.g. manure). Figures 13 and 14 show the quantities of phosphorus and nitrogen discharged to inland waters by sewage treatment plants each year. As New South Wales has the highest inland population, its sewage treatment plants also discharge the highest quantity of nutrients. The four river systems that receive the highest loads of nitrogen (greater than 100 tonnes per year) and phosphorus (greater than 30 tonnes per year) from sewage treatment plants are the Murrumbidgee, Hawkesbury-Nepean, Namoi and Hunter. Figure 13: Tonnes of phosphorus discharged by inland sewage treatment plants each year. Source: Data for New South Wales, Victoria, Queensland and Tasmania were obtained from licensing databases supplied by state regulatory agencies. Data for Northern Territory, Western Australia, Australian Capital Territory and South Australia were obtained from the National Pollutant Inventory 2000. Figure 14: Tonnes of nitrogen discharged by inland sewage treatment plants each year.